Jannes: Interesting behind-the-scenes look, and also something of an counterpoint to the tendency of over-romanticizing Jack and the gang that we, or at least I, are sometimes guiltily of. If you're a Beat-geek you can't really ignore this one. caflores: Gente que busca y no sabe qué. privycouncilpress: A road trip film symbolizing the mindtrip your soul will have while reading 'Ye Ole Fiendly Towne and Other Whittier Zombie Haikus"
Finally, finally I read this book. I struggled with it, trying to find some sense in the story. When I let that go (around half way), it got a bit better. The story itself still confuses me. Why on earth would anyone get up and travel the country like Sal (and his friends) do? How can you leave your kids? How can you leave behind your travel mates when they are ill? El Sal Paradise de todas las ediciones conocidas de esta novela mítica es aquí, al fin, Kerouac. Y también Cassady, Ginsberg y Burroughs aparecen con sus verdaderos nombres. Con la publicación del rollo original, la gesta viajera y existencial de En la carretera se vuelve autobiográfica de pleno derecho y a plena luz del día, sin censura alguna. Y el relato adquiere toda su potencia narrativa. El lector tiene en sus manos una suerte de manifiesto de la beat generation. Seguimos a Kerouac y a toda la cáfila que desfila por estas páginas en toda su desnudez y penuria. Precursores del movimiento hippy y la contracultura de finales de los años sesenta, los personajes de esta novela pululan sin rumbo por Norteamérica. La sed vital insatisfecha, la búsqueda de horizontes de sentido, de dicha y de conocimiento y los atisbos místicos se estrellan contra una realidad inhóspita y desesperanzada. Un vívido compendio de los grandes temas, y al tiempo una apasionante aventura humana y una metáfora de la existencia. «El rollo original de On the Road es una de las más veneradas y enigmáticas reliquias de la literatura moderna... Un texto fascinante» (James Campbell, The Times Literary Supplement). ". . . and I shambled after as I've been doing all my life after people who interest me, because the only people for me are the mad ones, the ones who are mad to live, mad to talk, mad to be saved, desirous of everything at the same time, the ones who never yawn or say a commonplace thing, but burn, burn, burn like fabulous yellow roman candles exploding like spiders across the stars and in the middle you see the blue centerlight pop and everybody goes 'Awww!'" In the window I smelled all the food of San Francisco. There were seafood places out there where the buns were hot, and the baskets were good enough to eat too; where the menus themselves were soft with foody esculence as though dipped in hot broths roasted dry and good enough to eat too. Just show me the bluefish spangle on a seafood menu, and I'd eat it; let me smell the butter and lobster claws. There were places where hamburgers sizzled on grills and the coffee was only a nickel. And oh, that pan fried chow mein flavored air that blew into my room from Chinatown, vying with the spaghetti sauces of North Beach, the soft-shell crab of Fisherman's Wharf- nay, the ribs of Fillmore turning on spits! Throw in the Market street chili beans, red-hot, and french-fried potatoes of the Embarcadero wino night, and steamed clams from Sausalito across the bay, and that's ah-dream of San Francisco. Add fog, hunger making, raw fog, and the throb of neons in the soft night, the clack of high heeled beauties, white doves in a Chinese grocery window. Great beautiful clouds floated overhead, valley clouds that made you feel the vastness of old tumbledown holy America from mouth to mouth and tip to tip. Every one of these things I said was a knife at myself. Everything I had ever secretly held against my brother was coming out: how ugly I was and what filth I was discovering in the depths of my own impure psychologies. Sal Paradise, un giovane newyorkese con ambizioni letterarie, incontra Dean Moriarty, un ragazzo dell'Ovest. Uscito dal riformatorio, Dean comincia a girovagare sfidando le regole della vita borghese, sempre alla ricerca di esperienze intense. Dean decide di ripartire per l'Ovest e Sal lo raggiunge; è il primo di una serie di viaggi che imprimono una dimensione nuova alla vita di Sal. La fuga continua di Dean ha in sé una caratteristica eroica, Sal non può fare a meno di ammirarlo, anche quando febbricitante, a Città del Messico, viene abbandonato dall'amico, che torna negli Stati Uniti. Though Jack Kerouac began thinking about the novel that was to become On the Road as early as 1947, it was not until three weeks in April 1951, in an apartment on West Twentieth Street in Manhattan, that he wrote the first full draft that was satisfactory to him. 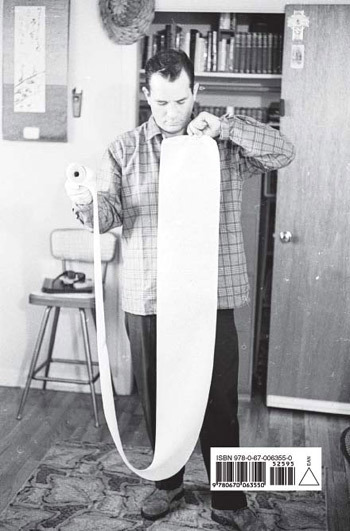 Typed out as one long, single-spaced paragraph on eight long sheets of tracing paper that he later taped together to form a 120-foot scroll, this document is among the most significant, celebrated, and provocative artifacts in contemporary American literary history. It represents the first full expression of Kerouac's revolutionary aesthetic, the identifiable point at which his thematic vision and narrative voice came together in a sustained burst of creative energy. It was also part of a wider vital experimentation in the American literary, musical, and visual arts in the post-World War II period. It was not until more than six years later, and several new drafts, that Viking published, in 1957, the novel known to us today. On the occasion of the fiftieth anniversary of On the Road, Viking will publish the 1951 scroll in a standard book format. The differences between the two versions are principally ones of significant detail and altered emphasis. The scroll is slightly longer and has a heightened linguistic virtuosity and a more sexually frenetic tone. It also uses the real names of Kerouac's friends instead of the fictional names he later invented for them. The transcription of the scroll was done by Howard Cunnell who, along with Joshua Kupetz, George Mouratidis, and Penny Vlagopoulos, provides a critical introduction that explains the fascinating compositional and publication history of On the Road and anchors the text in its historical, political, and social context. Celebrating 50 Years of On the Road A 50th anniversary hardcover edition of Kerouac's classic novel that defined a generation. On the Road is the quintessential American vision of freedom and hope, a book that changed American literature and changed anyone who has ever picked it up. Why Kerouac Matters: The Lessons of On the Road (They're Not What You Think): John Leland, author of Hip: A History argues that On the Road still matters not for its youthful rebellion but because it is full of lessons about how to grow up. See Jack Kerouac's legacy profile. See Jack Kerouac's author page.